The following article was written by Beth Robertson, Research Fellow at Women's Earth Alliance. This article was published in the Spring 2011 "A Matter of Spirit" newsletter published by Intercommunity Peace and Justice Center. To read more click here. Women in Bimbilla, Ghana—and women all over the world—are the cornerstones of their communities. They shoulder the burden of water-harvesting, spending countless hours fetching and managing water for drinking, agriculture and cooking. Women are also key to improving access to safe drinking water in their communities. In 2010, two powerful women leaders from Ghana—Florence Iddrisu and Fulera Mumuni—participated in a training through the Global Water’s Initiative. They were introduced to four different area appropriate technologies designed to address issues of water and sanitation. Following the training, these women leaders developed an action plan to construct a rainwater harvesting system that would serve the women’s dormitory at their local high school. Florence and Fulera chose Bimbilla High School for their project because, like many schools across Africa, it was not equipped with ample water facilities. Students and teachers would often have to bring water to school or fetch water during class time, limiting time devoted to studies. Florence and Fulera’s pilot project brought tremendous change to Bimbilla, decreasing the hours that female students have to walk in search of water. The female dormitory at Bimbilla High School now has a complete rainwater harvesting system that serves 210 female students, providing them improved access to potable drinking water at the school. Today, Florence and Fulera continue to spread knowledge of low cost, effective solutions to inadequate sources of water in other areas in their community. Safe drinking water is a human right and the participation of women in conceiving technologies to address issues of water and sanitation is essential. 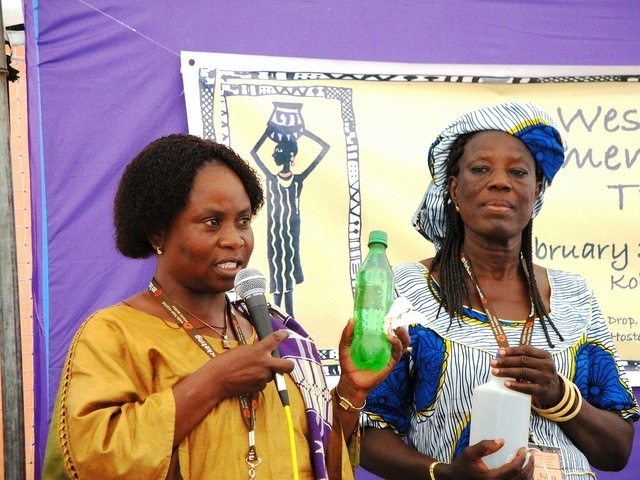 The Global Women’s Water Initiative (GWWI), a program of Women’s Earth Alliance in partnership with Crabgrass, embraces the idea that local women leaders who understand the needs of their communities merely need the resources, confidence and training to inspire change and improve the health of their communities. GWWI holds capacity-building trainings throughout Africa to equip local women leaders with technology training, networking support, and seed funding to launch sustainable water projects in their communities. “Access to fresh water and sanitation does not only improve the health of a family, but it also provides an opportunity for girls to go to school, and for women to use their time more productively.”1 Women are the stewards of their natural resources in their communities and therefore hold the key to improving access to safe drinking water in their communities. Florence and Fulera’s model succeeded because of its bottom-up, grassroots nature. Top-down, dependency driven development solutions have failed communities too many times. Co-designing solutions to development challenges based on local vision rather than outside wants are the foundation for sustainable development—investing in existing leadership and knowledge of women who know what their communities need most. This approach avoids the pitfalls of top-down practices and outsider-generated attempts at assistance that can fall short or even reinforce damaging dynamics. For sustainable development to take root, we must rely on the local, environmental stewards and community caretakers to identify and co-design solutions that address issues of water and sanitation. Local women understand the needs of their community; all they need are the resources and confidence to design solutions and engineer change.